After your gallery is generated you can change something in the gallery options and then re-generate only the modified part of the gallery. This window lets you choose which part of the gallery to re-generate. The gallery consists of 3 main parts: pages, thumbnails and full-size images. You can choose any combination of the gallery parts to re-generate using this window. Using the Select thumbnails to re-generate... button you can select which thumbnail images need to be re-generated. 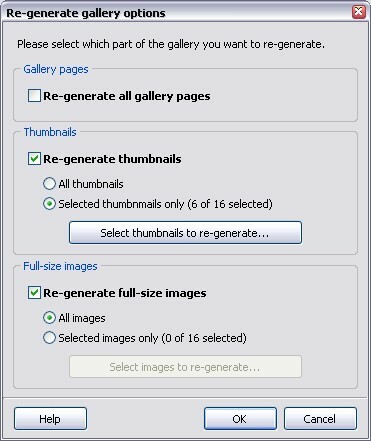 Select images to re-generate... allows you to choose which full-size images will be re-generated. When you choose a new template for the gallery, the entire gallery must be re-generated.